The T6SS is considered as a versatile machinery due to its ability to inject toxins to either prokaryotic or eukaryotic cells, to mediate interbacterial interactions or pathogenesis. We have reported that the EAEC Sci-1, Sci-2, the Citrobacter rodentium CTS-1 and Salmonella enterica Typhimurium T6SSs have anti-bacterial activities (Brunet et al., 2013) (Gueguen et al., 2013) (Brunet et al., 2015) (Flaugnatti et al., 2016). A large number of T6SS effectors with antibacterial activities have been characterized. 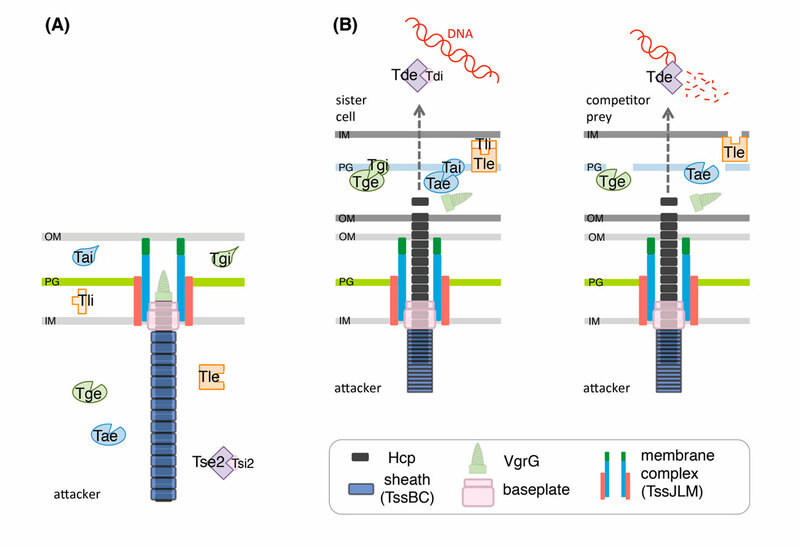 Cell-wall targeting effectors called Tae (type VI secretion amidase effector) and Tge (type VI secretion glycoside hydrolase effector) degrade the peptidoglycan of target cells. Membrane targeting effectors like Tle (Type VI lipases effectors) hydrolyse the membrane phospholipids of the target cells. Finally, effectors with nuclease activity (Tde family) have also been identified. These antibacterial effectors are produced concomitantly with specific immunity proteins to prevent self-intoxication. Schematic representation of the T6SS in the extended (A) and contracted (B) conformations. A selection of characterized effector proteins (Tae, Tge, Tle and Tde), and of their cognate immunity proteins (Tai, Tgi, Tli and Tdi, respectively) is shown. In a sister cell, the activity of the effector proteins will be counteracted by the cognate immunity protein (B, left) whereas if the prey cell is an unrelated species/strain, the effector proteins are delivered into the periplasm or the cytoplasm of the competitor to degrade the target molecule (cell wall for Tae and Tge; membrane lipids for Tle; DNA for Tde) (B, right). (Durand et al., 2014). Nicolas showed that Sci-1 is involved in interbacterial competition and identified Tle1/Tli1, a toxin/immunity couple encoded downstream the vgrG1 gene. In collaboration with the group of Stéphane Canaan, Nicolas showed that Tle1 is a periplasmic acting toxin with phospholipase A1 and A2 activities and responsible for the inter-bacterial activity mediated by the Sci-1 T6SS. Self-protection of the attacker cell is secured by Tli1, an outer membrane immunity lipoprotein that binds tightly to Tle1 to block its phospholipase A1 activity (Flaugnatti et al., 2016). (A) Schematic representation of the EAEC 17-2 sci-1 T6SS gene cluster. (B) The anti-bacterial competition assay assessed by mixing E. coli K12 gfp+ prey cells with the indicated EAEC attacker cells. (C) Tli1 inhibition of Tle1 phospholipase A1 activity. Phenotypes observed after injection of the V. cholerae VgrG1 CTD into fibroblasts (left, WT CTD ; right, catalytic mutant). 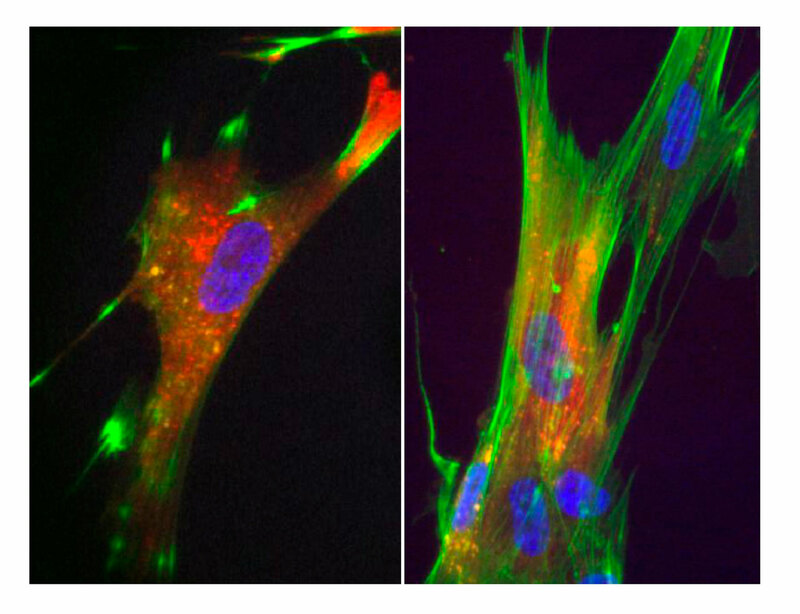 The actin cytoskeleton is colored green and the purified VgrG1 protein is colored red. In addition to anti-bacterial effectors, several anti-host effectors have been characterized. These toxins can be either independent or fused to the C-terminal of VgrG protein, the T6SS puncturing device. For example, the toxin carried by VgrG1 of V. cholerae catalyses the covalent cross-linking of G-actin in an ATP-dependent manner. This activity prevents host cell cytoskeleton rearrangements and thus protects V. cholerae from phagocytosis by macrophages. 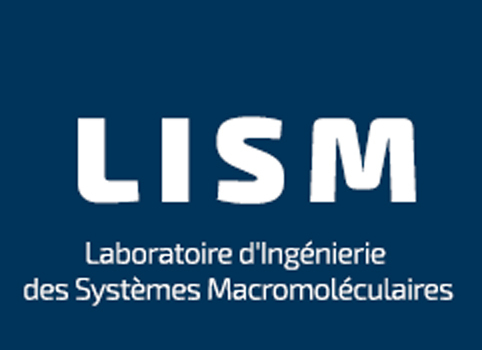 In collaboration with the group of Christian Cambillau (AFMB) and Gilles Audoly, Eric purified the C-terminal domain of VgrG1 (CTD) and found that the protein is active to cross-link actin and causes actin dynamic curbing when injected in macrophages or fibroblasts. The crystal structure of the VgrG1 CTD was solved. The structure exhibits a V-shape, with the catalytic site located at its base. 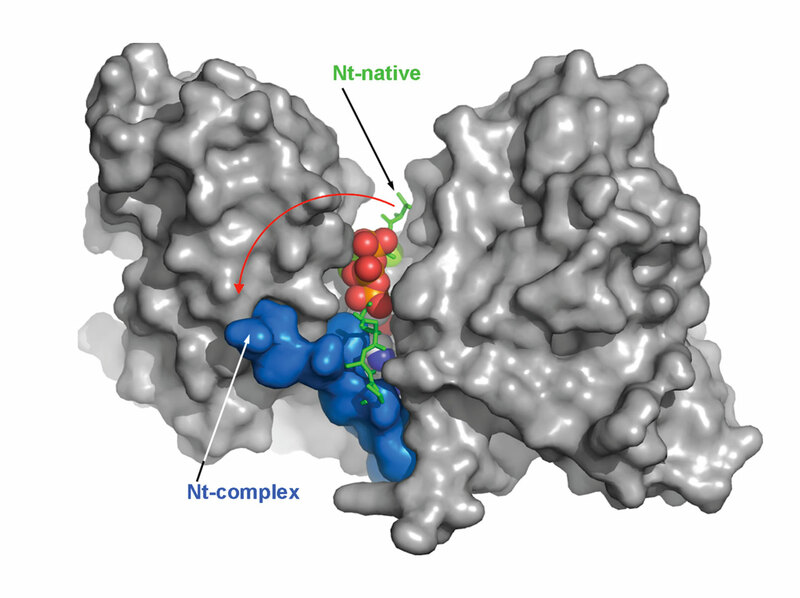 The N-terminal domain that seals the active site is displaced upon ATP binding, rendering the active site available for actin binding and cross-linking (Durand et al., 2012). The current model for the T6SS mechanism of action describes that upon contact with the target cell, the T6SS sheath contraction propels the inner tube made of Hcp proteins and VgrG towards the target cell, piercing the membrane using the VgrG–PAAR complex and hence delivering the toxin effectors. 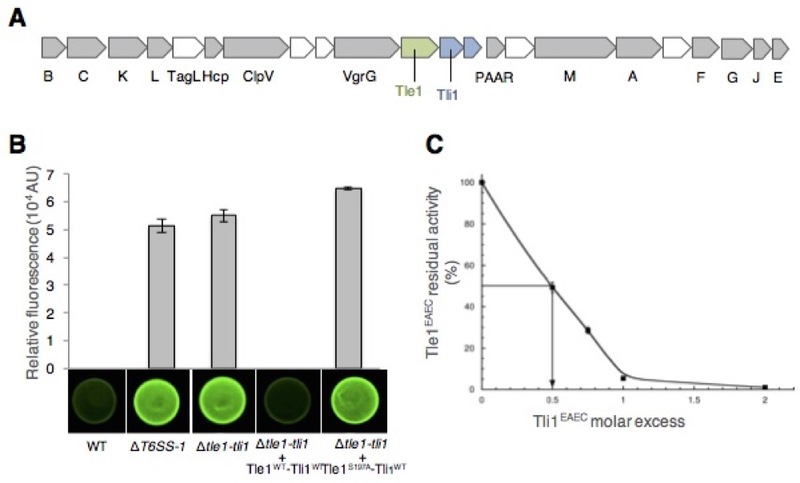 Indeed, by using fluorescence microscopy with a prey colored in red and a T6SS+ predator producing the TssB-GFP fusion protein, Yannick demonstrated that sheath contraction correlates with lysis of the prey cell (Brunet et al., 2013). Time-lapse recordings showing that contraction of the T6SS sheath (in green, the contraction event is pointed by the white arrowhead) coincides with the lysis of the prey cell (in red). 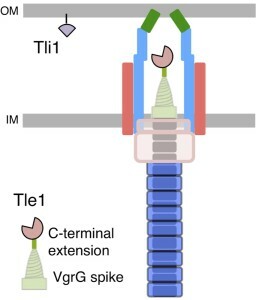 EAEC Tle1 delivery into the periplasm of the prey cells is mediated by a cargo mechanism in which Tle1 directly binds to the VgrG spike C-terminal extension. T6SS toxins exist either as independent proteins or additional modules fused to the VgrG, PAAR, or Hcp components. These effector modules are hence delivered into the target cell upon sheath contraction. The current transport models for independent toxins propose that these effectors bind to the VgrG, PAAR, or Hcp proteins directly or via adaptor proteins, and therefore that these structural components of the machine are used as carriers (Silverman et al., 2013; Shneider et al., 2013; Hachani et al., 2014; Durand et al., 2014). Nicolas demonstrated that the EAEC Tle1 phospholipase toxin interacts directly with the VgrG1 spike protein. 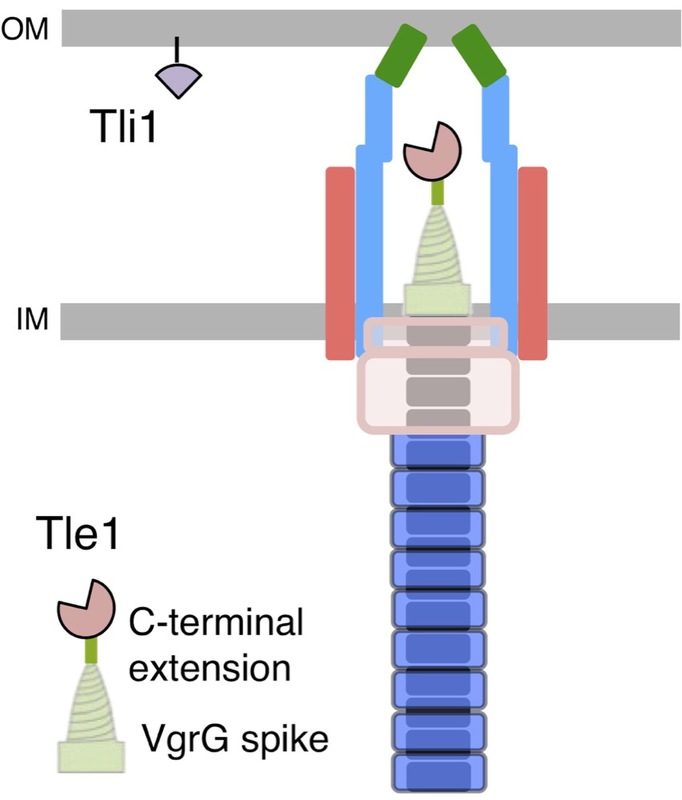 The C-terminal extension domain of VgrG1, including a transthyretin-like domain, is responsible for the interaction with Tle1 and required for the subsequent delivery of Tle1 into target cells. (Flaugnatti et al., 2016). For further information, we refer to a recent review from our group on the T6SS effectors and mechanisms of delivery: Durand et al., 2014. You can also find information on the T6SS of Escherichia coli, Salmonella and related species in the EcoSalPlus chapter.